These are an interesting little snack that can get quite addictive. They are a great low-carb alternative to regular crisps (chips). 1. Preheat the oven to 200°C/400°F/Gas mark 6 and line a baking sheet with baking parchment. 2. Mix the Parmesan and dried herbs together well. 3. Place tablespoons of the cheese mixture on the lined sheet, spacing each heap about 2.5cm (1 inch) or so apart to allow room for them to spread. 4. Bake for 3–5 minutes until golden. Leave to cool and turn crisp. 2. Wash the beetroot (beets) thoroughly and dry. Cut into very thin slices (think regular crisps [chips]) and place the slices in a bowl. 3. Mix the oil and balsamic vinegar together and whisk well, then pour over the beetroot slices and toss together well, making sure the slices are completely coated. 4. Spread the slices out in a single layer on a baking tray (you may need several trays or to do this in batches). 5. 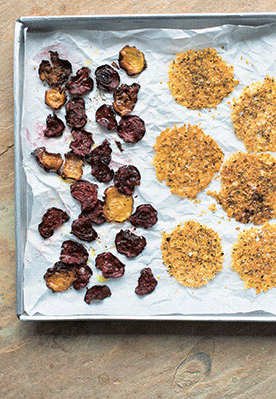 Sprinkle a generous pinch of salt over the beetroot and bake for around 30 minutes, or until crisp. Recipes taken from How to Cook Healthily by Dale Pinnock (RRP £20, Quadrille) Photography by Issy Croker.